Build the farm of your dream! Anna is back again! This time she is even more enthusiastic, active and full of great ideas! Do you want to take up farming? 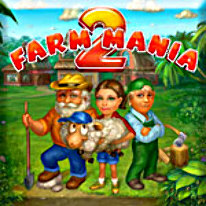 Fruits and vegetables, animals and birds, bakeries and textile factories all await you in Farm Mania 2! Help Anna and her husband, Farmer Bob make all their dreams come true! Prove you are the best farmer in the neighborhood. Learn new skills, buy advanced equipment and take good care of your household to make your farm look better and nicer!